DIVERS ITEMS ON SALE !! Released by the Bay Area’s own 1-2-3-4 Go! 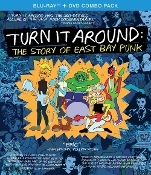 Records, the two-disc Blu-ray / DVD combo pack edition of the Turn It Around: The Story of East Bay Punk documentary features the full-length theatrical cut of the film (2 hours and 37 minutes), five deleted scenes and more. This combo pack is a must-have item for any music documentary enthusiast or fan of East Bay punk. The film explores Northern California’s pivotal role in evolution of punk rock—the loud, intense and anti-authoritarian philosophy of music and politics that arose in the late 1970s. Early San Francisco Bay Area punk pioneers like the Dead Kennedys, Avengers and Flipper, as well as the Maximum Rocknroll fanzine helped take the punk underground global. This documentary features a diverse spectrum of musicians and artists who have all been impacted by or participated in the California San Francisco Bay Area punk music scene of the 1970s, 80s, and 1990s. The documentary’s cast reflects the deep renowned diversity of the creative community surrounding California’s Bay Area by featuring interviews with past and current members of 924 Gilman, Maximumrocknroll, Dead Kennedys, Avengers, Flipper, Green Day, Rancid, Lookout Records, Neurosis, Operation Ivy, Crimpshrine, Jawbreaker, NOFX, Primus, Metallica, Bikini Kill, AFI, Bad Religion, Guns ’N’ Roses, Fugazi, 7 Seconds, Dicks, Subhumans, and many, many more. Today, one knows about some of the bands who emerged from this scene, like Green Day and Rancid, but their success is just the tip of the iceberg; the roots of this inspiring story go deep into the underground. Narrated by Iggy Pop and executive produced by Green Day, Turn It Around: The Story Of East Bay Punk is told by the people who were there. The story of East Bay punk rock unfolds from it’s unlikely beginnings, continues through it’s struggles, and triumphs with it’s raucous power continuing to be influential today. Copyright © 2014-2019 Headline Records. All rights reserved.